The most successful gladiators in the Roman Empire were more than just highly skilled fighters, they also knew the value of style, because winning the crowd was just as important as winning in combat. So as well as ensuring they were victorious in every brutal battle, the celebrated gladiators made sure to entertain and enthrall the 50,000 spectators crowded into the famous Colosseum with some good old-fashioned flair and showmanship, and were duly loved by the masses. 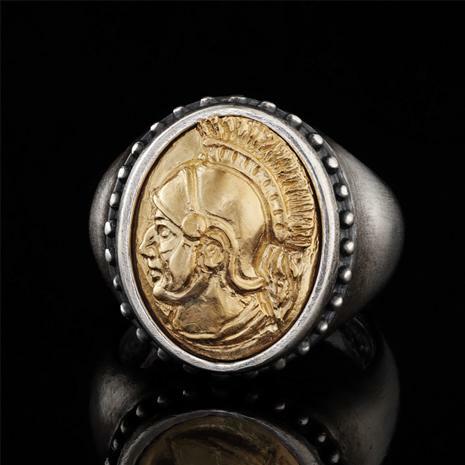 The Gladiator Ring is designed for men who know the value of getting up every day and winning with style, men who are looking to add a little extra panache to every hard-earned success. The gleaming .925 sterling silver ring features the gold-finished sculpted profile of a gladiator, which sits on your finger as a reminder to win, and win well.